IHE connectathon (final) day 5: 2570 tests verified. 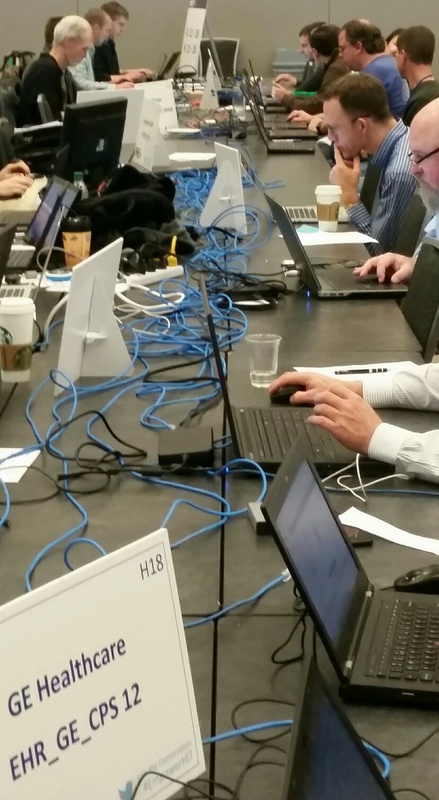 The majority of the IHE connectathon tests are from the ITI (IT Infrastructure domain), i.e. 62%. This is quite a shift from when it started being a pure radiology imaging test event. Radiology tests made up only 15% of all the testing this year. At the first connectathon in 1999 held in the garage of the RSNA in Chicago, we were focusing on interfacing a radiology imaging modality with an information system by querying a worklist, and having them reliably send to a PACS for viewing and reporting, i.e. the Scheduled Workflow (SWF) profile. Since then, other domains have been added such as for cardiology, pharmacy, patient care coordination and devices, quality and research/public health, laboratory, dentistry, eye care, pathology, radiation oncology and even national extensions, and last but not least the IT Infrastructure. Not all of these domains were tested during this connectathon week, about 50% as, for example, eyecare and dental might do their own testing, but this was definitely the most extensive event. The shift in testing to the ITI domain is an indication of how imaging is becoming an IT project: the emphasis is on how to manage and exchange documents and images within and across the enterprise. Just as an indication, the X* profile family with includes all of the XDS (cross enterprise document sharing) and cross community sharing included an impressive 1475 test instances. This does not include all of the PIX/PDQ (patient ID cross referencing and query) and CDA (clinical documents) verifications, another approximate 600 test instances. This indicates a shift and focus which also impacts the supporting staff. I remember the often heated discussions at trade conferences and within panels of whether a PACS should be supported by radiology, meaning a PACS administrator reporting to the radiology manager, or IT, which is a non-issue today. Most of these people I talk with are already moved or will be. This reflects the trend toward enterprise image management, including multiple specialties and making them available outside the enterprise, therefore it is only for the better. Overall the connectathon was a very successful event, someone estimated that, for this week only, the people investment is a few million dollars (think 500 people times 40 hours), not taking into account the facility cost and weeks of preparation. But there is no question that the money saved by getting together and testing your product is multiple times that. Already looking forward to next year! And...remember that there are a lot of resources available on www.ihe.net, and if you like to learn more about the details, there are regular webcasts by OTech, see link. Wow! Connectathons are doing wonderful things! Now, IT needs to focus on getting an Enterprise Service Bus (ESB) installed at their institution so enterprise image handling will be in use everywhere! I agree with the ideas shared on this blog, this is great. Great post. Thanks a lot for sharing this. here we have some truly phenomenal Happy Deepavali 2016 Greeting cards, Diwali 2016 wishes pictures and HAPPY DIWALI IMAGES messages that you can impart to siblings, cousin and friends.So, I think Diwali 2016 will be an extreme celebration for our perusers. Thank you for giving this excellent information..it's really more helpful to me..